We’re adding lots of business partners to our bake sale locations, and this morning I sent information on how to help to our 100th volunteer! In spite of all that support, we still need items to sell at all five locations, especially west, east and downtown. If you can help or want more information, send us an email. We’ll send you the sign-up sheet for the location of your choice and more details about our needs and the logistical plans for Saturday. Lots of people have asked for a blog button so that they can advertise the bake sale on their blog. It’s here! You can grab the code for the button from the sidebar at the right and stick it wherever you want. Thanks to volunteer Lauren for the blog button design. We have also added some more downloadable materials, including a sign and some more versions of the flyer to the post below. 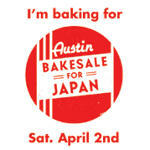 Finally, we’re working on some posts to preview all the delectable treats that will be available for sale on Saturday. If you’ve posted a recipe or photo about what you’re making for the sale, please let me know so that I can include you in the round-up! We’re also linking to all the blogs and other media who mention the bake sale on the Press page of the blog. If I have missed you, please let me know in the comments or via email. Need help? I’ll volunteer if I can. Also, can I donate a couple baked goods? Jon, we do need help and baked goods. Could you drop me an email at AustinGastronomist at Gmail dot com so that I can send you instructions for how to sign up? Thanks! I will have to snag a blog button. thanks! Oops, I just realized it says “austin” on it – I’ll have to find a “brooklyn” one!